As midmarket organisations send their workers out into the world, the use of wireless devices — laptops, personal digital assistants (PDAs), smart phones, tablet PCs, and so on —continues to grow at a rapid rate. The workplace is now the client site, a hotel room, an aeroplane, a café, and the home office. This distributed workforce brings about a growing list of concerns, including data theft, electronic sniffing, malware, complexity, and increased demands on IT. 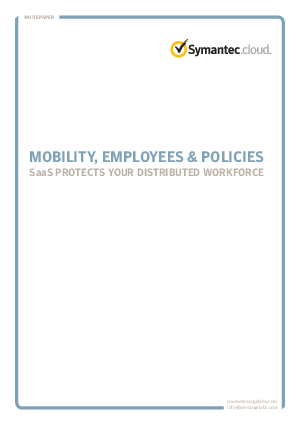 This white paper details the risks involved in making your workforce mobile. From here the paper identifies some of the benefits of moving to a SaaS model of security, and discusses these in depth.